Life is good! We finally got all the solar panels set up yesterday, it was too late in the day to benefit from sunlight, it was nearly dark. Bob wired up the Xantrex charge controller, this device is wired between the solar panels and the batteries, it makes sure the batteries don’t get overcharged, it does other things too to make sure the batteries are maintained at peak performance. 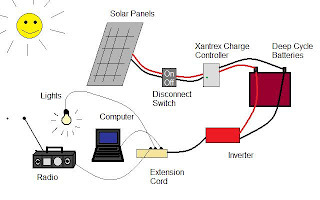 I created an image to show our solar setup, it’s a very simplified image, but it shows basically what we are using. It goes basically like this, the solar panels are on the roof at about a 30 degree angle facing south, they have a positive and negative wire running to a cut off switch (this is like a large on-off switch), from there the wires go to the charge controller (this regulates the amount of power that goes to the batteries, and maintains the batteries at peak performance), from this the wires go to an inverter, this changes the power from DC (direct current-battery power) to AC (alternating current-this is what comes out of your wall), from there I have an extention cord with multiple outlets and I can plug in whatever I want as long as it doesn’t exceed the voltage or amperage allowed by the inverter, the inverter is one of my bigest bottlenecks, it can do 1000 watts sustained, and 2000 watts surge (when you first turn on anything, it usually requires a surge of higher power then it settles down to a smaller power requirement), and it can handle up to 8.5 amps, so I can’t run any single item or sets of items that requires more than that. Click on the image below to see the full size picture. For the most part, I am running small items, a couple of low wattage fluorescent lights, a small radio/CD player, a laptop computer and charging my cell phone. I have a dorm room size refrigerator, but so far we haven’t needed to plug it up, it stays fairly cold, even during the day when it warms up, in the shade it’s still pretty cool, we keep our milk, eggs, cheese and butter in a 5 gallon bucket, we keep it in the cabin most of the time, if it gets too warm inside during the day, we set it outside in a shady spot and it stays cool enough. Right now we are using our refrigerator to store foods outside and protect them from animals, I expect this spring & summer we will actually plug in the refrigerator and use it for what it is supposed to be used for. Sometime in the future, we will also have a wind generator, we have all the parts for the windmill part now, we just need to get a long pole and a few other items to set it up. We have enough wind here that we should never be without power, the sun shines all day (most of the time) and the wind blows all night (and often during the day as well). We had a uninvited guest living in the cabin for some time now, it was a cute little gray mouse, it would come out at night after we went to bed and dine on or chew up what it could find. The other night, shortly after I went to bed, I heard it scurrying around and heard it chewing on things, so I got up (man was it ever COLD! I wasn’t happy about getting out of my warm bed! 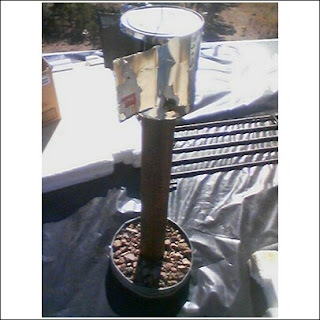 ), I saw it running across a 2×4 piece of wood heading for the table (and the cookies that were left out), so I found the mouse traps I had purchased a few days earlier, and baited it with peanut butter, I set it out in a likely spot, and about half an hour later, the trap went off. Bob went over to the trap just in time to see his (or her?) little tail stop wiggling, it appears that it didn’t suffer, the kill was quick and clean, of that I am glad, I’m not interested in torturing the little critters, I just don’t want them in my cabin chewing on everything and pooping everywhere. I set up another trap but haven’t seen any evidence of any other mice, I am hoping that one was a lone ranger. Right now Bob is fabricating a directional wind screen for the wood stove flue, with all the winds around, often smoke is forced back down the flue and into our cabin, that happened to us twice now to the point where we had to pull the burning material out of the stove and put out the fire, last night it was bad, our cabin filled with smoke and nothing we did would stop it, fortunately it wasn’t very cold and we could open up the windows and air out the place. 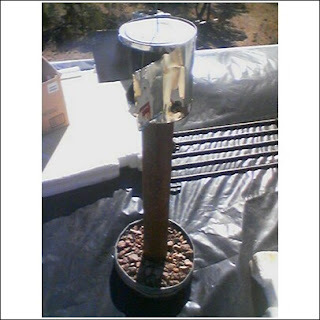 So today, Bob is using an old paint can to make a directional cap with an opening on one side that will blow away from the wind and not allow the wind to blow down the flue, it will help with the draft in the fire box too. I’ll try to get a picture of the finished “product” and upload it here. At great peril, I did manage to get on the roof and snap a few pictures, and it works! 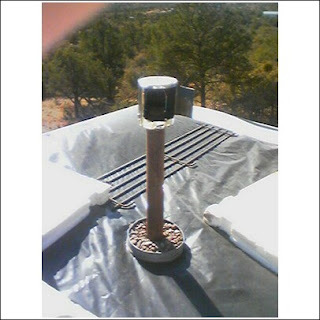 The opening faces away from the wind and prevents the wind from blowing the smoke back down the flue, it also assists with the draft, Bob came back inside the cabin and lit a small, smokey fire, he opened the door on the fire box completely and tried to make the smoke come into the cabin, it would not, it continued to go up the flue, that is a good thing! I’m not afraid of heights, but boy is it scary to be up on the roof of the cabin when the wind is blowing and gusting hard, (it’s essentially 3 stores tall) on top of that, you have to be careful where you place your feet, it is best to be on top of a rafter and not in between, you know when you have stepped in the wrong spot, the deck bows under your feet, not a very good feeling, especially when you are trying to keep your balance against the wind! Thanks for writing, it makes me feel like I’m not doing this for nothing (bad English, I know, grin).